Even the most perfectly done up homes are like canvases that can do with a splash of creativity. And contrary to popular notion, you don’t need bottomless pockets to decorate your home. Frugality is the order of the day folks and here are twenty ideas that will rev up the aesthetics and boost up the functionality of your home without costing an arm and a leg. BTW, for number 16,12,4, and 1, you should play this video to learn more. This video also re-represent all ideas in this list and if you want to find one or two original author of these ideas follow hyperlink inside subheading. If you are still not hooked on to indoor succulents, then here’s a great way to get started. This DIY succulent garden looks great in the day and blinks away in the night. It has LED lights, a nifty little camper van and a bunch of plants in a bounty of colors and hues. The best part, it can be done in a few hours and doesn’t cost more than $50, especially if you already have the plants at home. You can decorate this in a million different ways with lego and small figurines or go creative with the plant lay outs. P.S. When exposed to a surplus of light, succulents develop a natural blush that looks out of the world. Unless you were living under a rock, you must have seen the amazing ‘Love’ shelf that went trending a while back on Pinterest. Here’s a cheaper but equally amazing replica. This one spells ‘HOME’ and it’s an easy way to create a focal point to display all your favorite memoirs. All you need is some pallet pieces, a staple gun, some wood glue and some chalk paint. Bingo! 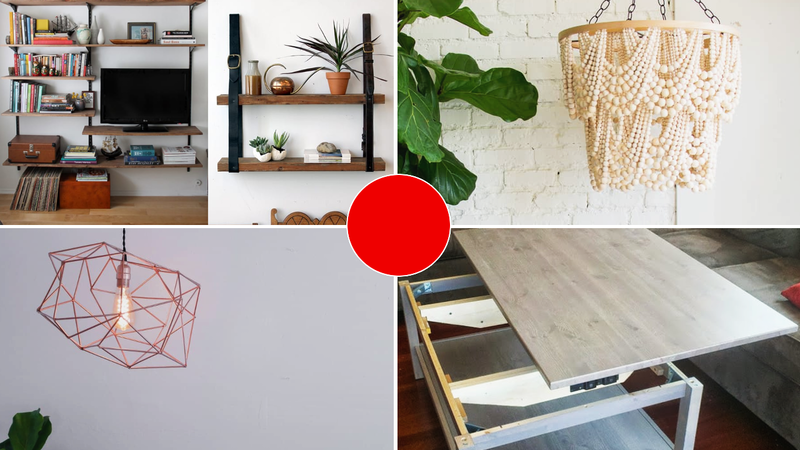 You have your own custom DIY Pallet home shelf. It can be wall mounted using the saw tooth picture hangers and it can go anywhere from your living room to your study. Hate that empty wall staring at you? Or those mundane photos on the wall that look outdated? Replace them with Map art. Maps are vintage but they still blend in with just about any décor theme. Another way to revive that insipid looking empty wall is to make it a painted focal wall. If you are drastically short of ideas or if painting isn’t your cup of tea, then here’s an easy DIY tutorial to help you get going. This is a retro diamond design that has loads of color and has a pop-out effect. It creates the perfect focal point for your furniture and is roughly an hour’s work at best. Your tools? Some painter’s tape and some paint. Also, we love the detailing on this tutorial. It certainly takes the guesswork out of the whole thing. A message, an emoji, a quote, your short term goal, a letter board is aesthetic and functional at the same time. Here’s an easy DIY way to create a beautiful textured letter board with small wood dowels, some glue and some felt. There are umpteen ways to customize it and you can easily change the message every day. It can be wall mounted or displayed on your desk. And it won’t cost more than $25 to make. That’s décor on a budget for you. Shelves add personality to a wall and in a micro apartment or a small room, they are the easiest way to organize your things without looking cluttered. This DIY mounted shelving tutorial shows you a no-brainer way to create your own customized shelves. The keyword here is ‘customized’. Irrespective of whether you need shelves to store your books or one to accommodate your TV or gaming console, this can be tweaked to make that possible. It’s cost effective, easy and customizable. What more can you ask for? The author hacked this one straight from IKEA and it’s a brilliant way to avoid reaching out for your munchies while having coffee. Just lift the top of the table and pull it towards you. When not in use, the top locks back into its original position. It’s comfortable, practical and looks sweet. This DIY tutorial saves you tons of money as well. The lift-top hinges are sourced from china and with some planning, you can convert any existing table into a lift-top one. P.S. Add some hidden storage space in the support area that you will create for those hinges. Tuck away secret messages or your favorite candies in them. A couple of thick, worn leather straps and two old wood boards are all that you need to make this beautiful floating shelf. It looks straight out of a thrift shop and creates the perfect conversation piece for your living room. As always, the horizons are wide when it comes to customizing this to your liking. Colored leather, exotic leather, layered shelves, painted ones, we are already excited thinking about the ways in which this can be tweaked. And you can size it up or down folks. Houseplants do a lot more than cleaning the air. They can liven up a space with some much needed color and when displayed right, they can easily accentuate the aesthetics of the room. Here’s a minimalistic concrete stool that can be the perfect pedestal for your indoor plant. Have string of pearls? Swap those hanging pots for this concrete stool and let the cascading layered effect pop out. All you need is some concrete and three wooden dowels. You can also paint this or add glass concrete aggregates to create a smooth countertop like surface. This little inspiration will probably bring a new smile on your children’s face. At least for few weeks. This idea requires 18×24 engineer prints, white-coated particleboard, wood stain, and Rust-Oleum Navy Blue Spray Paint. First, call your local print shop before you proceed to the next step. It is important because printing images as an engineer print demand more inks and your print shop will probably reject your project. Next, when you select your image, find photos with at least 25-50% white background area. If your favourite photos are too cluttered with various images, you can edit them first in photoshop or Gimp or let someone in Fiverr does the job for you for few dollars. The precious few minutes of leisure on the couch can be interrupted if you have to reach out frequently for that mug of cuppa or for your snacks. This DIY side table solves the problem. It has legs that slide under your couch while the top of the table rests perfectly on the armrests of your sofa or club chair. It is incredibly easy to make and it looks stunning. Perfect for that weekend woodworking project. P.S: If you intend to use this as a parking space for heavier objects, then you might want to attach the top to the legs using screws rather than using glue as mentioned in the tutorial. A new décor item is only a ‘repurpose’ away. Put your old glass vases or even a tumbler or a utensil holder to good use and convert them into decorative vases. They can be so useful to store the tiny nick knacks that otherwise get lost in the labyrinth that homes tend to be. We don’t blame you for drooling over pictures of a bead chandelier that went viral on social media. It does look drool worthy. The best part is that you don’t have to spend $500 to buy it online. With some spare time and some effort, you can make your own one. Here’s an easy DIY tutorial for you. You will need wooden beads of varying sizes, embroidery hoops, twine, scissors, some glue, drill, a handsaw and some pliers. It sounds a lot more difficult than it is. If you have no experience with embroidery, then this is a great way to learn some of the basics. Oh, almost forgot! Total damage is less than $180. You don’t really need to be a rye farmer to have a Himmeli light fixture hanging over your dining table. It’s one of the most ornate décor pieces that you can add to your home. But if you have been wondering how you’d be able to replicate those crazy geometrical patterns (we certainly did), then follow guide inside hyperlink. This DIY light fixture guide gives you a complete blueprint to creating your own Himmeli light fixture. You make it out of lollipop sticks or thick plastic sticks that are hollow from the inside. At the end of the project, you will be left wonderstruck at how easy it turned out to be. Terrazzo is making a comeback of sorts and why not. It’s versatile, cheap, durable and aesthetic. But if a home flooring remodel is out of bounds for now, then here’s an easier way to show your love for terrazzo. These Terrazzo styled magnets will add a speckle of color on your refrigerator door or just about any metallic surface that you fancy. The DIY is straightforward and they can be cut into a variety of geometric shapes. There’s something about rope that gives it a rustic charm when used for décor. Be it for hanging or for more creative purposes like this rope planter, it will surely make for a minimalistic, but interesting addition to your home. This DIY method uses ½” thick white cotton rope. But the sky is the limit here. You can also experiment with thicker, colored varieties of rope to create this. Some hot glue and a planter to use a mold and you are done. The results will awe you. Guess we can never have enough of magnets and planters. So we club the two to give you this amazing magic planter. It can be perfect for your indoor plants and it looks surreal when the planter can be mounted to any metallic surface without the need for hooks or screws. The method is a little labor intensive. But in the end, those floating planters make it completely worth the time. You can experiment with shapes, sizes and color. P.S. Use milk paint and then sand the surface to create a vintage, distressed looking floating planter. Yeah, we warned you about our love for magnets. Here’s another project that gives you a svelte-looking picture frame for your favorite photographs or posters. A couple of wooden slats, magnets and a leather strap is all that it takes. It is uncomplicated, easy to mount and customize. You can change the picture at any time as well. When it comes to using metallic décor, copper tops the list in popularity. And for good reason. It has an old world industrial charm to it and it acquires an amazing patina with time. If you were looking for inspiration to add some copper to your home, then here’s a DIY curtain rod that looks straight out of the boiler room of the Titanic. It involves copper rods and you have the option to spray paint it with any metallic color of your choice. The author of the tutorial used gold spray paint. But personally, we prefer letting copper age naturally. Well, it’s up to you really. Here’s the preview for you anyway. And it looks stunning as always. This rainbow cloud lamp is the stuff that party dreams are made of. It features an interactive light that syncs with your smartphone and flickers according to the beats of the songs you play. But that’s not it. It looks like a cloud hanging in your room and if the track has thunder or lightning sounds, then the light pattern mimics a real thunder cloud. While the original light that was the inspiration for this tutorial costs well above $3000, this one can be made in less than $300. Don’t blame us if you want to make a bunch of these for all rooms in your home. What do you think DIYers? How many of these crazy décor pieces are going to adorn your homes?